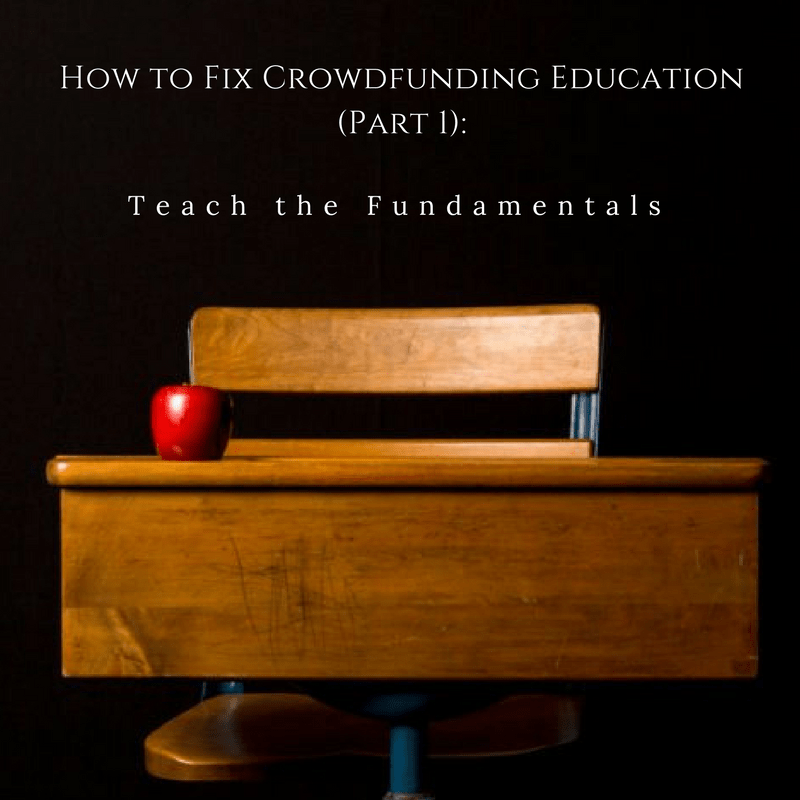 Since publishing my article “Why We Need to Address Crowdfunding Education Now” on Crowdfund Insider last November, I am often asked what would be my first step to fix crowdfunding education. My answer is simple: I would start by teaching crowdfunding – not rewards, not donation, not equity, not lending, not marketing, not finance, not securities law, not even entrepreneurship. I would teach the fundamentals of crowdfunding: the dynamics that exist across all types of crowdfunding activity. Let’s start with the broadest definition of crowdfunding and the key lesson that must begin any curriculum. General consensus defines crowdfunding as “gathering small amounts of money from a large number of people, usually via the internet.” By that definition, a fundamental principle that differentiates crowdfunding from other forms of finance is that crowdfunding is defined by the ratio of the number of participants to the amount of their contributions. And in this ratio, the most important number is the number of participants, not the amount contributed. This flies in the face of most of what we read in media coverage of crowdfunding. When was the last time a headline celebrated a campaign’s huge number of backers or investors? But in fact, a recent study out of North Carolina State University found that the number of backers, not the amount of money raised, was a better indicator of the future success of a crowdfunded business. 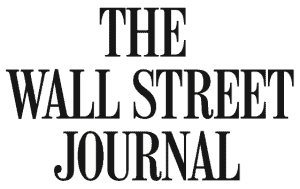 A notion persists that crowdfunding activity is driven by the entrepreneur and the platform. Not so. Crowdfunding is a participant economy driven by the crowd. And yet, we do little to nothing to educate the crowd on how they can participate and why they would want to. We cannot expect our industry to grow without making participant education a priority. Otherwise, we may face the same fate as individual campaign creators who launch without engaging the crowd first: they don’t reach their goals. We need to take a comprehensive look at the holes in existing training materials and the quality of the messages promoted in the media. 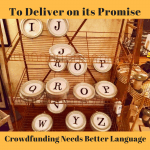 Almost all of the educational materials around crowdfunding are focused on the person launching the campaign and not on increasing awareness and participation from new communities of potential backers or investors. Instead we allow misleading media pictures to define crowdfunding – unicorn stories of entrepreneurs raising millions of dollars (when the majority of campaigns raise amounts in the thousands) and grandiose accusations of fraud across the industry after one bad apple gets past the crowd (when crowdfunding fraud rates are far lower than in the mainstream economy ) – and then we validate the stories in our own online marketing materials. Because…well, it gets us clicks. But what are we selling? Not crowdfunding. Some sort of mutant marketing tool, but not a participant economy. 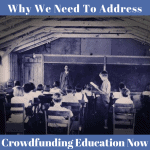 Understanding the importance of participation is the key to crowdfunding education. This may seem like an aberration, but more than half of the inquiries I get for crowdfunding consulting are from individuals who have never backed a campaign themselves. Even if you don’t believe there is something karmically wrong with putting your hand out to the crowd without ever becoming a part of the community yourself, there is a problem with the fundamental economics of this situation. There will not be a large enough pool of backers to make crowdfunding a sustainable industry. That’s aside from the fact that one of the cheapest and best educational tools for how to run a successful campaign and how to nurture relationships with backers and investors after the close of a campaign is to back other campaigns. But beyond the educational merits of backing campaigns prior to launching your own, there’s an even bigger reason we must focus our efforts on encouraging participation: impact . The majority of society feels distanced from their ability to impact larger economic forces. We don’t think that what we do can have impact – that our individual financial resources are too small to be influential. Crowdfunding not only allows for the aggregation of smaller financial resources to increase their influence, but the networks created around campaigns act as a multiplier on that influence by aggregating non-financial resources. That’s not the picture our industry is showing to potential participants. We are not making it clear that crowdfunding only works with their full participation: social, creative and financial. Instead we alienate by focusing on a single bottom line: the money. According to HIPGive , a bilingual crowdfunding platform focused on fundraising for Latino nonprofits, that single bottom line approach is particularly detrimental if we wish to engage traditionally excluded and underserved communities. And while the majority of the population is not participating in crowdfunding, we, as an industry, will have little impact, too. We need to encourage more participation across all forms of crowdfunding as they lead to and reinforce each other. But instead equity crowdfunding professionals belittle rewards and donation crowdfunding as some poor step-child. Multiple equity crowdfunding presentations online and at conferences have described rewards crowdfunding as giving away “t-shirts and tchotchkes” and sexist comparisons such as calling equity crowdfunding “not your daughter’s Kickstarter campaign” are not uncommon. Not only is this downright insulting, as rewards and donation crowdfunding continue to outpace equity in terms of number of participants, but it’s also short-sighted. Most people don’t jump into the deep end of the pool (i.e. supplying highly personal information like their birthdate and Social Security number to an online investment crowdfunding portal) without sticking a toe in first. Where would it make the most sense for people new to crowdfunding to put their toes in the water? More likely rewards or donation where a debit or credit card is all that’s needed to get started. So let’s encourage all participation, no matter the size or type. The first step in fixing crowdfunding education is to inspire more people to come to crowdfunding – all of its various shores – as participants. We must create experiences that demonstrate firsthand how the investment of our capital – social, creative and financial – can benefit the health and vitality of our communities, our small businesses, and our own well-being. We must create experiences that show, not tell, how crowdfunding is different from traditional finance, how it allows participants to have an impact – a choice, a say – and how it encourages democracy. We must create experiences that encourage diverse groups of people to claim their influence over what gets made and who makes it and who benefits.